Torpedo reload time reduction bonus increased from 10% to 15%. Remember that these upgrades are still undergoing testing and may change significantly. The aim of the changes is to diversify the gameplay of these well-known ships. This upgrade is currently too effective on the Radar equipped ships. The change is designed to balance this upgrade against the others in the same slot. Number of charges for Smoke Generator, Repair Party and Engine Boost decreased from 2 to 1 (from 3 to 2 for premium equipment), Defensive AA Fire remains unchanged. This way the ship can still use the consumables to get an advantage, yet fewer charges will require a more measured approach to when they are activated, and this will affect endgame phase the most. Firing range increased from 10970 to 12300 m.
Engine Boost consumable is now in a separate slot. These changes streamline the reload of torpedo launchers for the cruiser. 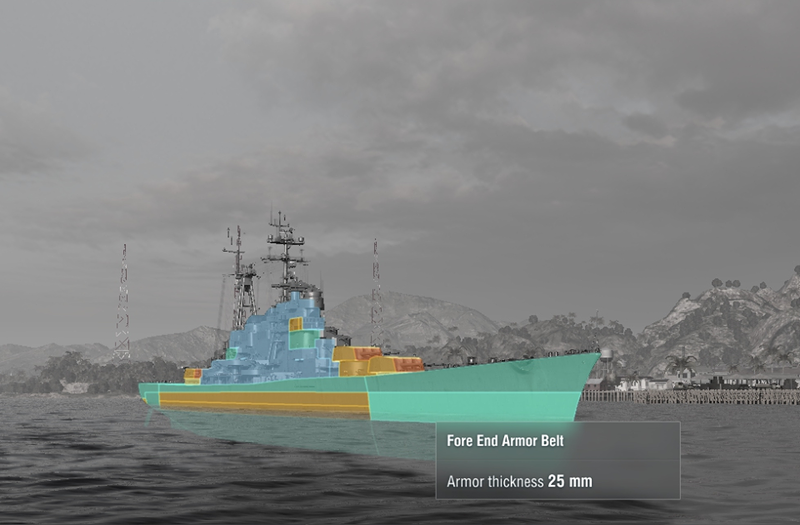 Better armor increases cruiser’s survivability and allows her to receive less damage through the fore and aft ends, as 50 mm plates can lead to ricochet of high-caliber AP shells from battleships, when angled properly. Might actually be somewhat enjoyable to play now… can I get a reminder on what her special module does? So I know what I gain from giving up faster gun reload?